Announcement I was in a head on collision a few months ago (10/19/2018). I am on the mend, but I have to limit my workload, so I only have one sheath listing for now and quantities are limited. As I recover more will be added. I was in a head on collision a few months ago (10/19/2018). I am on the mend, but I have to limit my workload, so I only have one sheath listing for now and quantities are limited. As I recover more will be added. 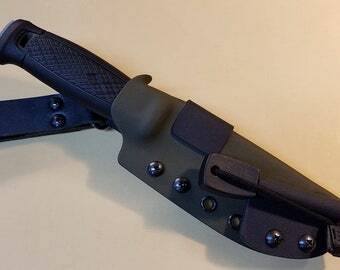 Perfect Kydex neck sheath for Mora Eldris. Super fast shipping. Will order more for my other knives! Exactly what I needed, perfect! My Mora Garberg fits nice and tight unlike the sheath that came with the knife. Jeremiah does excellent work.